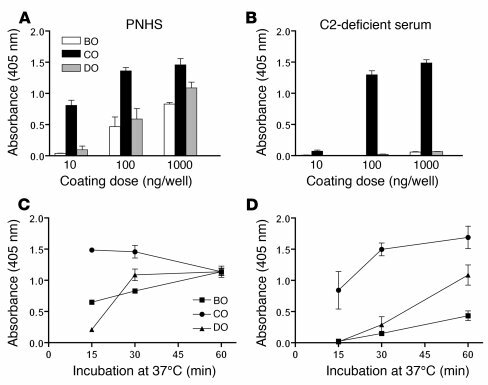 C3 deposition onto wells coated with O antigen–specific BO, CO, and DO following incubation in PNHS or C2-deficient serum. (A and B) Influence of the oligosaccharide coating dose. Serum (12.5 μl) in VBS (37.5 μl) was added to duplicate microtiter plate wells coated with 10, 100, or 1,000 ng of each oligosaccharide and to a control well. All wells were blocked with buffer containing gelatine. Plates were then incubated at 37°C for 30 minutes. (C and D) Kinetics of C3 deposition in wells coated with oligosaccharide at 1,000 ng/well. C3 deposition was detected with alkaline phosphatase–conjugated rabbit anti-C3c antibodies. Absorbance values were corrected for background. Each panel shows the mean and SEM for 3 separate experiments. Sera from 3 C2-deficient patients were used in the kinetic experiments.